Anyway, a couple of my friends had been asking me what I wanted to do for my birthday and I thought a drink on the Friday night would be nice then randomly while looking at a denim customisation workshop at Boda bar I saw an advert for a charity Fripping party at Hemma – one of Boda’s sister bars. Destiny? Fate? Or just the fact that I love the Swedish bars in Edinburgh 😉 Any way Friday night sorted! 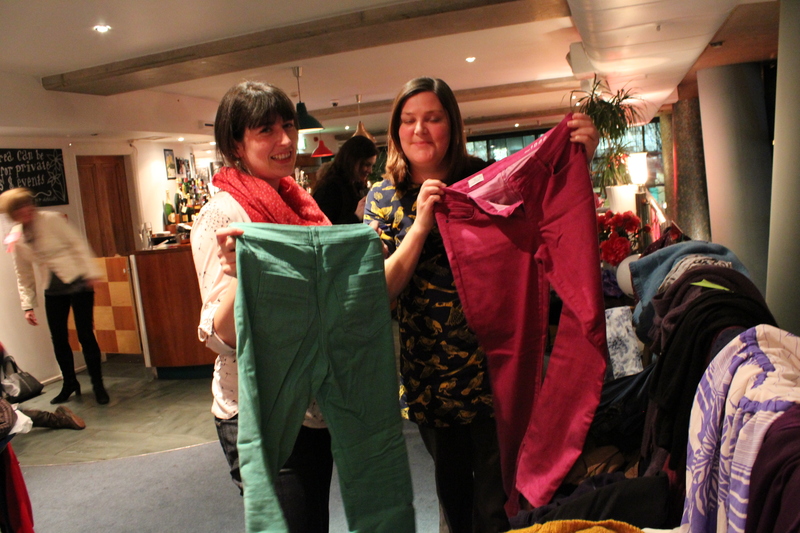 £10 ticket for a glass of fizzy wine, buffet and a chance to swap some unwanted clothing for something different, bargain. It was a nice, well organised event. We were immediately put at ease by the organisers and while enjoying our glass of fizzy wine, one of the organisers explained how the evening was going to work. Everyone had hung up their clothes in specific areas marked out for Dresses, Skirts etc and then we would get around a hour to look around the rails and put a sticky note with our name on anything we liked. Then after some food and a chat about the charity we could see if anyone else had written their name on the items we liked, if they hadn’t it was yours, if they had a wee auction would be held (prices to start low e.g. £1) with all money going to the charity. They would then auction off the more expensive pieces and hold the raffle, it all sounded good to me! So off we went to hunt through clothing, it actually showed the really nice character of people as everyone was commenting on how a dress suited someone or that a colour was really nice on them. I was immediately taken with some green skinny jeans – I have wanted some for a while but have never been 100% sure – so put my name on them. Both my mate and I found a few things we put our names on and when the time came to check if anyone else had put their names on them we were delighted to find we had a couple of items each that only we wanted. I took my name off one jersey as the lass holding it only had items where other people wanted them and I thought she should get at least one jumper – I had two things! 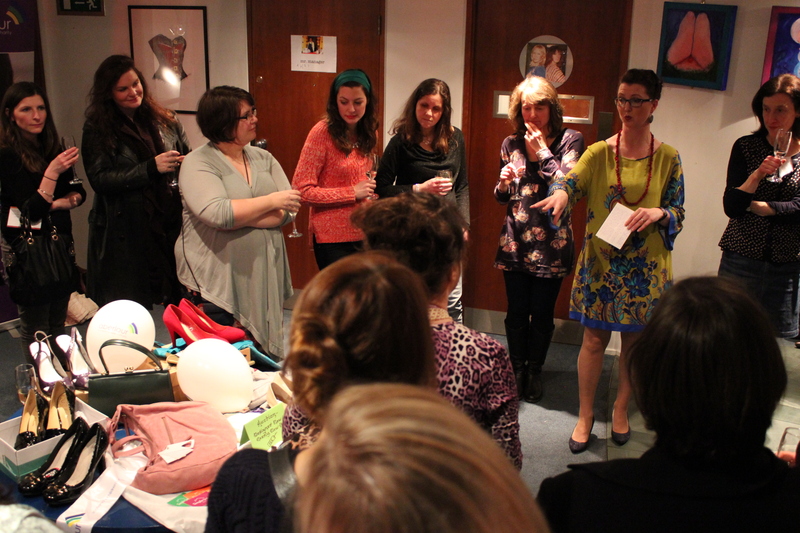 I then bid against a lass for a dress and won, then bid in the auction for a cardigan and got that too! All the shoes were too small for me sadly and a dress printed with cats was too big 😦 But what was nicer than all of those things (and they were nice) was watching other people be happy about getting our clothes we had put in to be swished! I put in a Monsoon dress that I had actually bought from eBay and the lass who took it will look lovely in it I am sure as the colour was perfect for her! A great night and I thoroughly enjoyed myself, to anyone thinking of going to a swishing event or organising one I think they are a brilliant way to update your wardrobe and to update other people’s wardrobes too. I went with 6 items and came away with 4 so I have also, technically, reduced the size of my wardrobe – and yes I did get those green jeans! The charity the event was held for was Aberlour Child Care Trust, read more about them by clicking the link below. 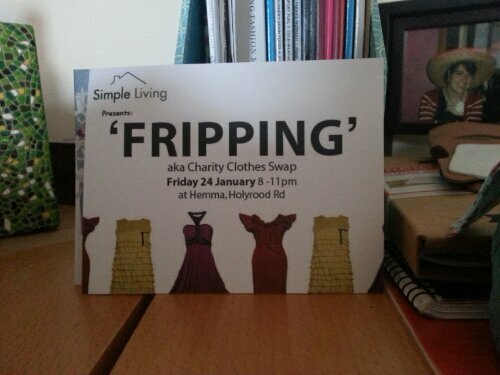 They are also planning on holding more Fripping events so if you live in Edinburgh I would recommend checking them out!